Please put pressure on to protect elephants, rhinos, tigers and all animals being killed for humans' weird wants and desires. Certain wildlife populations are being decimated by greed. Many turn a blind eye to the insanity. Armed militaries in Africa even help carry out the destruction! The US even finances entities who participate! This huge elephant tusk shipment in the news 12/11/12 was confiscated by Malaysian Customs. "KUALA LUMPUR (AFP) - Malaysian customs have seized 24 tonnes of unprocessed elephant tusks worth almost US$20 million (S$24.4 million) , the largest haul in the country to date, officials said on Tuesday.Some 1,500 tusks hidden in two containers were discovered by customs officials at the country's main port of Klang, in the western state of Selangor.The tusks had been hidden within pieces of timber inside the containers, which had originated from the west African nation of Togo.State customs director Azis Yaacub said in a statement that the cargo had been transferred from one ship to another in Spain and was believed to be headed to China." From Voice of America article: "Rampant poaching has been reported in the Democratic Republic of Congo and Republic of Congo, Cameroon, Kenya, Gabon, Mozambique, Tanzania and Zambia." From Wired article: "According to reports in September of this year, the Ugandan military swooped in to the Democratic Republic of Congo by helicopter to kill 22 elephants and steal a million dollars' worth of ivory. The Congolese and South Sudanese armies are also suspected of dealing in the trade, putting the spotlight on the US, which offers financial support and military training to all three nations." "When the elephant tusk haul was made in Malaysia, zoologist Iain Douglas-Hamilton, who has been tracking the ivory trade for 30 years, said "the price of ivory is making this situation insane," referring to the massive boost we have seen in demand in countries such as China, where an emerging middle class is willing to pay upwards of $1,000 (£620) per pound for the goods." 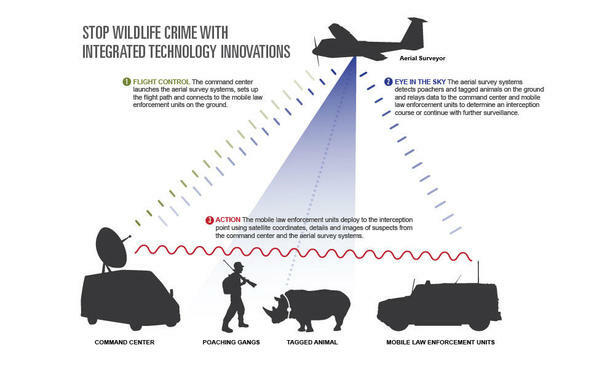 There is a small glimmer of hope for some remedy as reported in The Atlantic article: "Google Gives $5 Million to Drone Program That Will Track Poachers"